Since the Stanley Cup was carried ceremoniously off a chartered plane on June 10th around 4am, I have not been able to comprehend the transition my life would have to make. I turn on the tv this evening, but the only channels in my head at Comcast Sports Net and Versus. Earlier in the day, I was at the mall with a friend and everywhere I looked, someone was wearing a 2010 Chicago Blackhawks Championship t-shirt. The phrase hasn’t even sunk into my head, and the reality still hasn’t taken a hold of me. 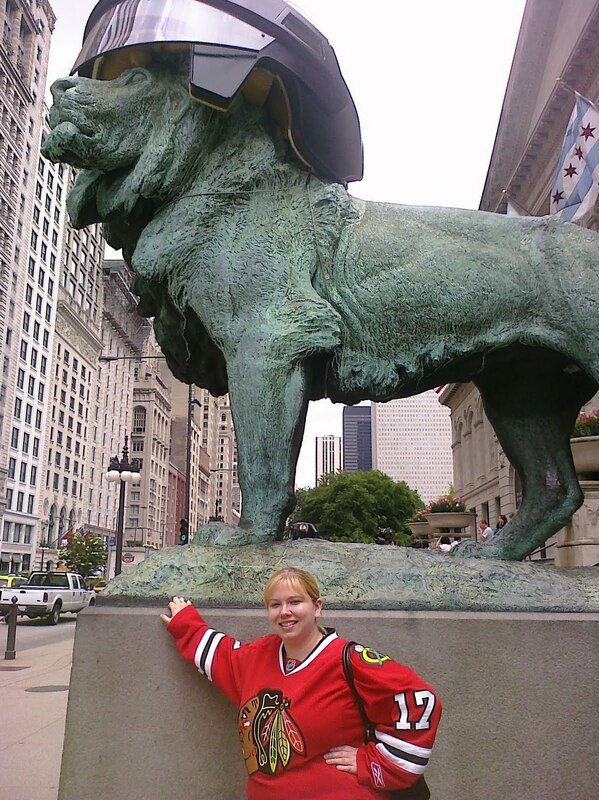 Last Friday, I made my way to Michigan Avenue with 2 other million people from the chicagoland area to glimpse at the cup myself. 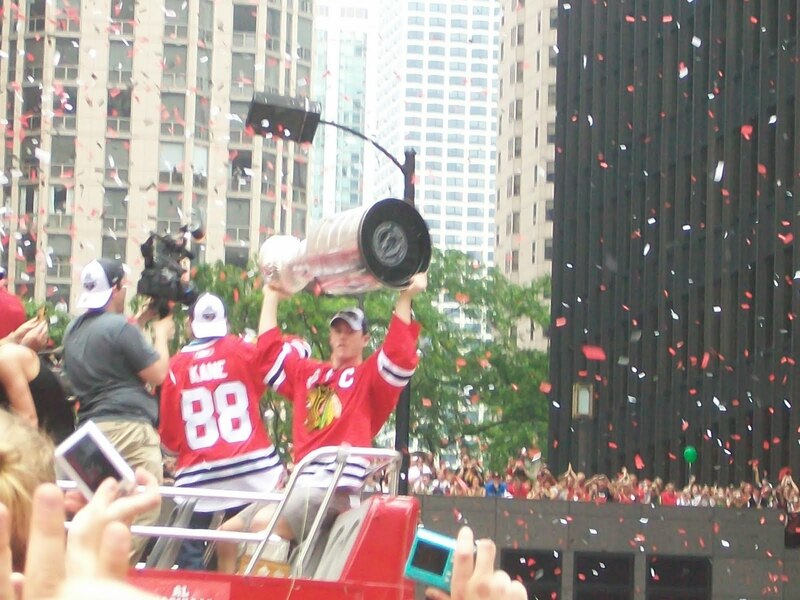 I watched it slowly creep down the street on top of a doubledecker bus with Patrick Kane and Jonathan Toews, and all I could do is hold my breath and soak in the goosebumps as they traveled around my body. Growing up in Chicago, I come from a generation of sports fans who complain about the Chicago Bears and argue over the Cubs and White Sox. But rarely did I find a fellow hockey enthusiast. My boyfriend and I began our relationship partly for our shared joy of watching hockey together. 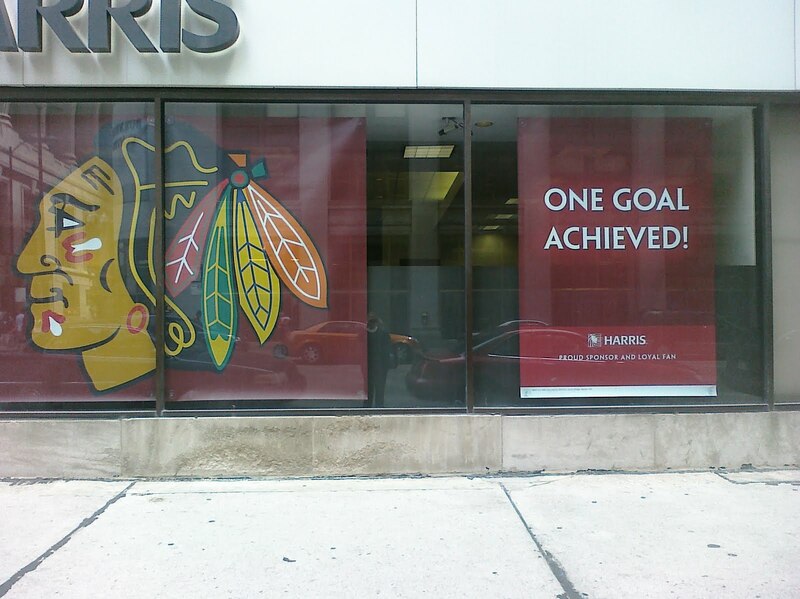 However, today in Chicago, almost the entire city rallies behind the Chicago Blackhawks. It began last year during the 2009 Stanley Cup playoffs when the Hawks made it as far as the Western Conference finals but defeated by the long-time rival, the Detroit Red Wings. I was afraid that in the following year, we would fail to make it to the playoffs again and that people would lose interest and curiosity. I was wrong. The 2009-2010 Chicago Blackhawks spent the entire year at the top of the Conference and in competition with San Jose who ended up taking the top spot but losing in a four game sweep to the Hawks in the Conference Finals. The roster that Coach Joel Quenneville managed was unstoppable all the way to the end. And I found myself overwhelmed with joy and completely numb in shock when Patrick Kane scored the game winning goal in game six against the Philadelphia Flyers. I mean that very literally. I was numb and motionless for nearly two minutes. The bar I was at for game six erupted in screams and laughter. In the corner of my eye, I saw all my friends hug and cheer and smile while I stood paralyzed by the thought that we actually did it. This means a lot to a city in doomed sports. I grow more impatient with the continued complaints of a dismal football team. I have no tolerance left for arguments about baseball and which team is better/worse. But I can finally share my love of hockey with millions of others. A lot of the loyal and long-standing fans dislike the newcomers. People at bars yell ‘kick the puck in’ without knowing that a kicked-in puck is always ruled a ‘no goal.’ But I don’t share their sentiment. Maybe I will when the bandwagon fans forget about hockey and put their sweaters to the back of their closet. But I like to think that hockey gained millions of new fans that won’t forget or lose interest. I expect the cup will not be long from Chicago’s reach for another 49 years. With the new owner, Rocky Wirtz in charge, the team has taken all the right steps. While the off-season will provide many changes to accommodate a salary cap, I hope to see a similar team of talented and hard working players and hope to move up on that season ticket waiting list.